Footballer of the Year nominee Ciaran Kilkenny has revealed the extent of the competitive streak that has driven him to win five All-Ireland titles. The Castleknock man was a pivotal player in Dublin's march to their fourth Sam Maguire on the trot this year but it hasn't always been plain sailing in the sky blue jersey. Recalling an under-21 defeat to Longford five years ago, Kilkenny revealed that he worked off the frustration of defeat with an 85km 'warm-down'. "We played Longford down in Parnell Park. I missed a free in the last minute of the game to draw," he told RTÉ Sport at Sure's announcement of the 2018 Championship statistics. "I was so annoyed that night that I ended up cycling to my granny's house in Portlaoise. "I was so frustrated about the game that I needed to burn off the energy. (It took) two or three hours I'd say. "I'm a very competitive individual. I was very upset about the loss so I ended up cycling. My glutes were in bits for a couple of days. "I just thought 'I need to do this. This will drive me on and make me a better player'. "It was late enough. She was just thankful I was alive! Lucky enough, she was still awake. I knocked on the window and she opened it up. "I was a bit sore the next day so I ended up hopping on the train with the bike with the granny, on the free travel. So I got home anyway." The 25-year-old, who had an astonishing 99.4% pass completion rate in this year's Championship, added that he and his peers had also been driven on by an even earlier setback - the surprise defeat to Tipperary in the 2011 minor football final. The then-dual star had also been on the losing side in that year's hurling decider against Galway. "Eric (Lowndes), Cormac (Costello), Conor (McHugh), a few of us would have lost the hurling final as well. 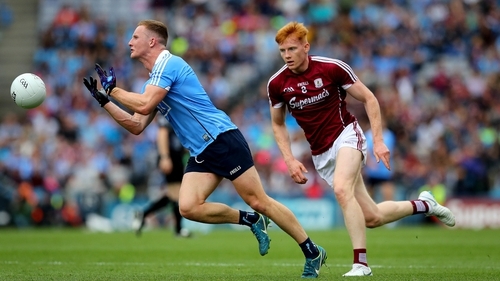 "I always remember after the football final seeing Jack (McCaffrey) in the dressing-rooms saying 'We're really hurting now but let this drive us on to be back here again and hopefully be contesting for titles'. "It was a special moment and a moment that's clear in my mind. "Fortunately, the next year we won an Under-21 All-Ireland and then won a senior All-Ireland. "But it's times like that you remember how if feels and it really motivates you. "That was an important moment in our careers." Despite talk of long-term Dublin dominance, Kilkenny, who is hoping to avoid "a few slaps" from inter-county team-mates John Small and Philly McMahon when Castleknock face Ballymun Kickhams this weekend, said the four-in-a-row winners weren't expecting the glory days to last forever. "For years Dublin weren't successful," he said. "1983-95, 95-2011. That's a span of 30 years and winning two All-Irelands. "It's gone so fast but we do recognise that we're so fortunate and lucky that we've got a special group at the moment. "It's not always going to be like that. There are going to be other teams that come along, that's just the nature of sport. "We just have to enjoy it and make the most of it while we can."